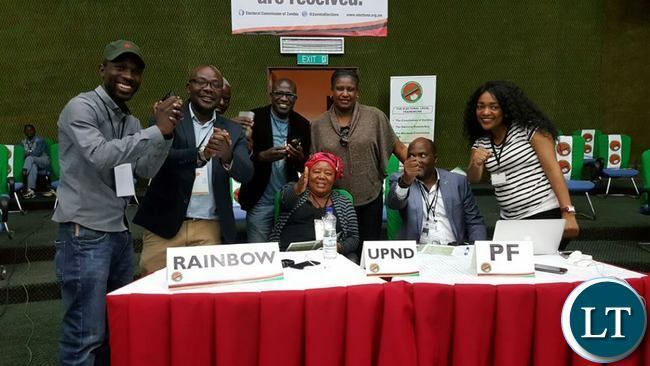 MEMBERS of different political parties pose for a picture to show a unity of purpose as they wait for results from the 2016 General Election at Mulungushi International Conference Centre in Lusaka. African Union (AU) Continental Representative Joseph Chilengi says Zambia needs a Political Parties Bill urgently because some parties are not relevant. In a statement yesterday from Khartoum, Sudan, Dr. Chilengi said the move taken by the Green Party to written to the President of the European Partners Against Corruption and the European Contact-Point Network Against Corruption (EPAC/EACN) for assistance relating to the procurement of 42 Fire Tenders by government is a confirmation that the Green Party is irrelevant. Dr. Chilengi states that the relevance of a political party is seen when it can handle national issues within national confines and deal with them internally and made apparent reference to South Africa’s opposition leader Julius Malema who uses national institutions when handling national contentions. Recently when he featured on Pan African Radio’s People’s Debate Programme Chilengi stressed the need for a higher benchmarks and scrutiny for registration of political parties. In a democracy all political paries are relevant and the pipo can decide on their relevance ot not. For the green party to seek assistance outside of zambia to an organization that is based in the region where the procurement occurred shows that the accountability and transparency and faith in the judicial system in za,bia is seriously comprised. Mr rainbow why posting too many and irrelevant comments like you’re voting yes. Who will set the bench marks? Who will be supervising adherence to these bench marks? Who will appoint the board that will supervise adherence to these bench marks? The problem in Africa, with such bench marks, you will find that the ruling party or party in government will start setting standards which are favourable to the ruling party. If written constitutions can be abrogated with impunity what about those tuma benchmarks? In any case what is the problem with the current set up? No wonder this man is speaking from Sudan? Agitators “Tuntemba parties” like UPND must not be allowed to bring anarchy and fulishness in the country.